Greetings & Salutations my dear friends. I am so glad you chose to join me. I thought we would talk about Peppermint this week. Peppermint (Mentha Piperata) is native to Europe (but grown in other locations) and has been widely used for thousands of years. It was used for its digestive properties by the Romans, and by the Egyptians before them. The active principles of Peppermint oil include menthol - the most important element - mentone, Limonene, menthene and phellandrene. English plants are said to produce the best quality oil because of their moderate climate. Although menthol is extracted and extensively used in pharmaceutical products, it is more effective when used in its 'whole' slate, i.e., as an integral part of the essential oil. This is true of many essential oils. Commercially the oil is used in flavoring toothpaste, various medicines and, of course, in confectionery. Peppermint is esteemed for its natural digestive support, but it is also an aroma that stirs up the mind, stimulating the circulatory system, calming the nervous system & opening up the respiratory channels. Blending peppermint oil with a gentle carrier oil like coconut oil makes a natural remedy for fungal infections like jock itch, athlete’s foot, ringworm & other bacterial & fungal infections. There’s been some evidence that diffusing peppermint oil in the air can alleviate tension headaches with as much efficiency as acetaminophen. Also, if you’re not able to diffuse it, place a drop on a handkerchief, gently inhaling. Peppermint essential oil clears physical & mental stagnation. It’s a proven stimulant & tonic for the brain, pancreas & heart. It clears the blood, lymph nodes, stomach & gallbladder. And it breaks through emotional blockages. Adding two drops into steam inhalation will help open up blocked sinus passages & cleans out mucus from the respiratory tract. When you mix a half ounce of Sesame oil with three drops of Peppermint essential oil, you can rub it on your stomach & abdomen. It will help relieve indigestion, diarrhea, nausea, bloating, constipation, flatulence, fullness & stomach cramps. 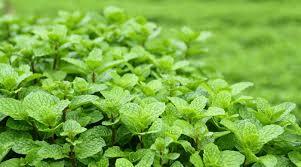 Peppermint oil is good for your skin, but it must be diluted. You can add two-three drops to a half ounce of sweet almond oil. Add a couple of drops to your daily lotions or creams. Use the mixture of sesame oil & peppermint against dandruff, dry itch scalp & even lice. Add three-four drops to your shampoo or conditioner for smoother, silkier hair. Diffused peppermint oil, in either a bath or diffuser, helps relieve menstrual cramps, muscular pain, urinary infections, nerve pain & so much more. A drop or two on your handkerchief can calm you. It helps in treating anger, mental strain, confusion, nervousness, depression, palpitations, vertigo, fatigue & anxiety. It can grant you immense energy & confidence throughout the day. It helps improve your concentration & memory. I’ve found that peppermint is a stronger aroma. Much more so than lavender or even lemon. I find I would rather take it a drop or two on a handkerchief or diluting it with other essential aromas as opposed to diffusing it straight. Peppermint is a hot oil, like lemon. So you’ll want to follow the same precautions. Stay out of the sun or sunlamp for at least 12 hours after applying to your skin. For massage oils make it no more than 1%. No more than a 3% blend with other oils. This is just the beginning of what there is to learn. I hope I’ve provided a foundation for you. 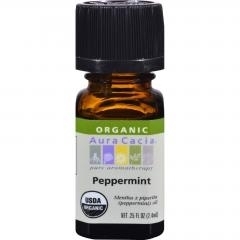 You can find Organic Aura Cacia Peppermint Oil at http://www.lbelitearomas.com/product-p/104-106-113-oep.htm#.